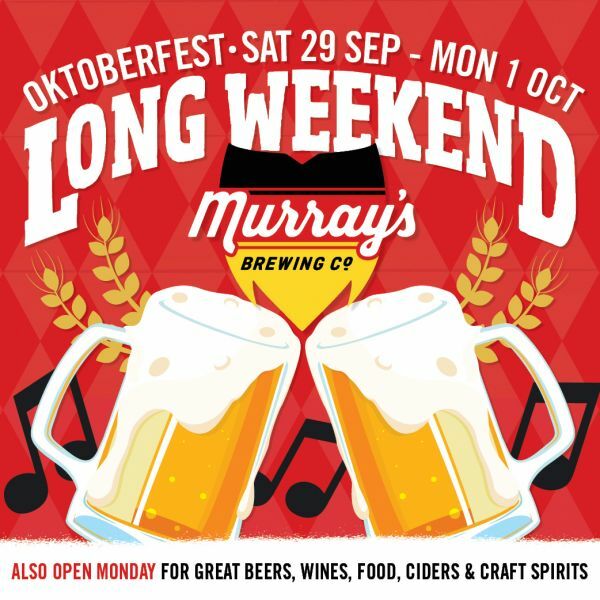 Oktoberfest launches at Murray’s Brewery this long weekend! The world’s biggest festival is returning to Port Stephens, with the launch of Oktoberfest at Murray’s Brewery this October long-weekend. And the celebrations will continue all month! Two specially-brewed festival beers, Oktoberfest food including pimped schnitzels, Kransky sausages, and pretzels with mustard, plus free ‘rocktoberfest’ concerts will feature at the Oktoberfest-themed Bobs Farm brewery. One of the region’s favourite bands, The Lamplighters, headlines festival entertainment with a huge free FREE concert on Sunday 30 September. While on Saturday 29 September Newcastle duo, Micro Circus, performs. And there will be live entertainment each weekend across October. “So break out the lederhosen, start practising your oompah-pahs and celebrate the world’s biggest festival, down under, at Bobs Farm. There’ll be spot prizes for best dressed. Hope to see you there!” says brewery owner, Murray Howe. The original Oktoberfest in Munich is the largest festival in the world. Last year, almost 7 million litres of beer was consumed there. This accounts for about 30% of the entire annual beer production of all the Munich breweries combined. Visitors also eat a staggering 400,000 sausages - or around one sausage for every two seconds during the festival’s business hours! And the festival record for number of beers carried in one go is 27! Many people may not know that Oktoberfest is also the name of beer style. “Technically, authentic ‘Oktoberfestbier’ is brewed only by the breweries within the city limits of Munich. All other beers brewed to emulate the original must be labelled Oktoberfest-style beer! Murray’s is also brewing a traditional Oktoberfest beer - or should I say Oktoberfest-style beer, which is smooth, clean, and rather rich, with a depth of malt character,” says Murray. “There will be loads of festival food specials to accompany our German-style beers – think schnitzels, sausages (maybe not 400,000 of them though), and pretzels with housemade mustard,” he added. What is known today as the world’s biggest beer festival actually started out as a Royal Wedding on 12 October 1810 – where a horse race was the big attraction, and not the beer. Today, Oktoberfest is all about the beer. The festival celebrated its 200th anniversary in 2010, and amazingly, only wars and cholera epidemics have briefly interrupted the annual beer celebration across the past two centuries. Sat 29 September (Micro Circus); and Sun 30 September (The Lamplighters). Open all day public holiday Monday 1 Oct.
All October long weekend (from 29 September), from 10am until 6pm. Free entry. Brewery Bus from Nelson Bay $5 each way on Sat and Sun.